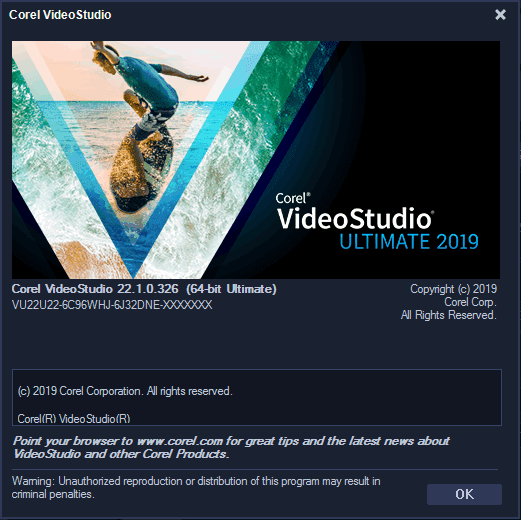 Corel VideoStudio Ultimate 2019 is a universal program, it can be used for various purposes - from editing video at home to creating professional-level recordings. Support AVCHD and Blu-ray-formats, chroma key, smooth transitions with transparency effect, tracking of specified objects, improving the color gamut of individual elements, a lot of filters and effects, frame by frame, the ability to connect plug-ins - this entire set of tools is available in the program. This makes Corel VideoStudio one of the best solutions in the industry. VideoStudio supports capturing, editing, authoring and saving video in HDV, AVCHD, TOD (JVC HD camcorder) and BDMV formats. In the program, for editing and previewing, low-resolution files are used, due to which much less system resources are required for editing HD-video. VideoStudio X8 also uses the new H.264 codec, supports importing and exporting video from the Apple iPhone and iPod Touch, improves the upload of video to YouTube, optimizes work with dual and quad-core Intel processors.